You will find many ways on the internet, on "how to" take care of this animal. This care sheet is showing the way we found works best for us from our many years of experience of caring for this species. As you might expect, in the wild Savannah Monitors live in the savannahs and grasslands of central Africa. Savannah Monitors grow fast and get pretty big. We recommend starting out a baby monitor in at least a 18" x 18" tank. Exo Terra's Small or Zilla's 20L critter cage both work well. In just 3 years, they can reach an adult size of a hefty 4 feet for males and somewhat smaller for females. When your monitor outgrows his baby tank, a 75 gal fish tank would serve him nicely for an intermediate enclosure. As a full adult, we suggest nothing smaller than an enclosure of 6' x 3' x 3'. This would be a custom made enclosure or DIY project. Make sure your homemade project is secure. Monitors are strong and they like to dig. If you have the room, always go bigger. A good rule of thumb is to have an enclosure at least 1 1/2 times the length of your monitor, including tail. They are active and smart. Error on the side of more room not less, and you and your monitor will be much happier. As your pet gets bigger, you can start letting him out of the enclosure for some "roaming" time. Savannah Monitors like to dig, so provide a deep loose substrate such as Zillas Jungle Mix alone or mixed with Zoo Med Repti bark or Exo Terra natural sand. Also, provide a hiding place for them to feel safe in when sleeping. This can be as simple as a piece of driftwood that is raised enough for them to go under or a reptile hide like Flukers half log. Monitors are quite hardy creatures. However, like all reptiles, they are dependent on thermoregulation to control their body temperature. This essentially means you need to provide a hot and a cool side to your enclosure. All the heat elements should be on one side and the other will be the cool side. This way your lizard can move back and forth between the different temperatures depending on its needs. A basking area of 110-130 degrees should be provided. The rest of the enclosure can be in the 75-82 range. At night, temps can drop to as low as 72 degrees. Use a good quality temperature gauge, like Zoo Meds digital temp gauge or Exo Terras Thermometer. Don't guess. The easiest way to increase the heat in your enclosure is with a Reptile basking bulb and/or an Exo terra or Zoo Med heat pad. There is some controversy on whether monitors need UVB lighting. We suggest using UVB lighting to help them absorb calcium and to synthesize vitamin D3. Since they are not out in natural sunlight in our homes, we must provide UVB light in the form of a special fluorescent bulb designed to produce UVB rays. The best bulbs are the mercury vapors such as Exo Terra's Solar Glo bulbs, ZooMed's Powersun, or Solar bright bulbs. These provide heat and UVB all in one bulb. You can also use separate basking (heat) bulb and UVB bulbs. If you use these, you'll want the Zoo Med 10.0 or Exo Terra UVB 10.0 variety. Always provide a nice sized water dish with fresh water. Your monitor will drink every day. Exo Terra bowls or Flukers rock dish are nice naturalistic non-porous water bowls. You might have to change the water everyday if your lizard defecates or kick bedding into it. Scrub the bowl at least once a week to keep bacteria slime from building up. Savannahs live in a somewhat dry area in the wild but they dig down and sleep in burrows with moisture. You want to recreate this by having deep bedding and misting it. So even when the top dries out the lower layers are moist. Another option is to provide a humid hide for your lizard. This is a hide with some wet moss or jungle mix inside. It's not easy to find a hide for a large savannah without making it yourself but our jumbo reptile hide box will work for quite awhile. You can feed in the cage or out. If inside the cage, do not hand feed your monitor. Rather, put the food on a plate or dish. You don't want your lizard associating your hand with food. 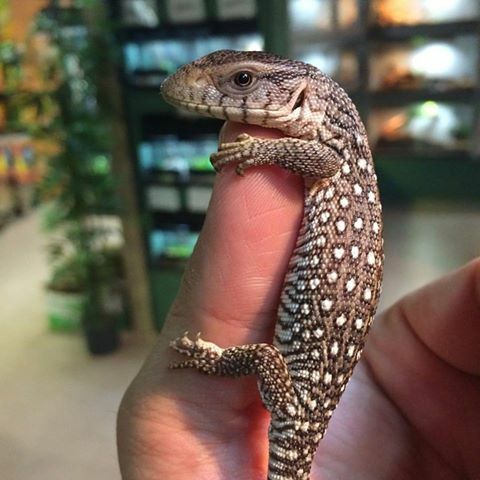 Savannah Monitors are quite intelligent and can become very friendly and even seek out human affection. Baby monitors, being small, are naturally a bit flighty. To them, you are large and scary. Be patient and consistent with your handling. Start slow and get them used to your presence. With patience, they can be very friendly and some will even become quite attached to you.